Sanita Puspure (left), Johnny Sexton (centre) and Kellie Harrington (right). 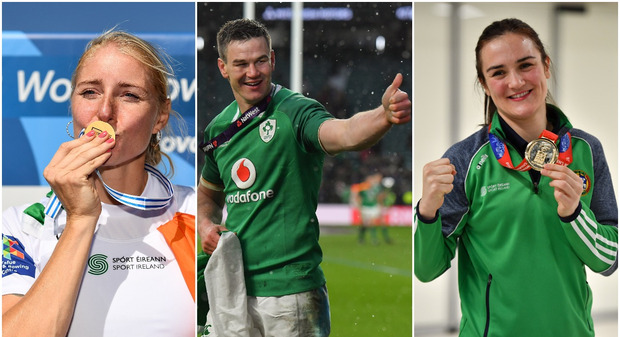 RTÉ have named 26 athletes in the longlist for their 2018 Sportsperson of the Year award. A wide variety of sports are represented, from Ireland rugby star Johnny Sexton to rowing world champion Sanita Puspure. Last year's winner was Ireland football international James McClean. Among the favourites for the award, as well as the aforementioned duo, are boxing world champion Kellie Harrington, European bronze medalist Thomas Barr and two-belt world champion Katie Taylor. RTÉ will narrow down the longlist to 13 before announcing the winner live on RTÉ One on Saturday 15 December at 9.20pm.